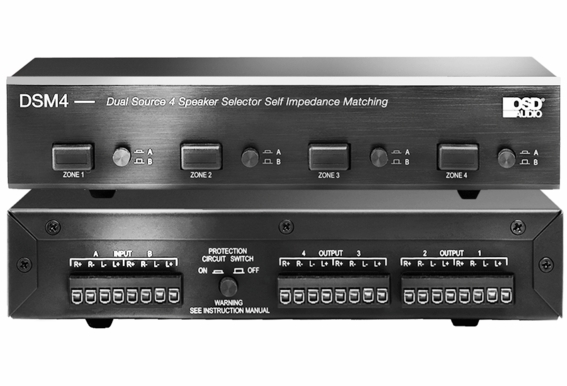 Speaker selectors allow you to connect multiple pairs of speakers to your stereo receiver or amplifier. This is a great custom feature that lets you listen to any pair of speakers, for instance in the kitchen or bath, or any combination of pairs simultaneously. 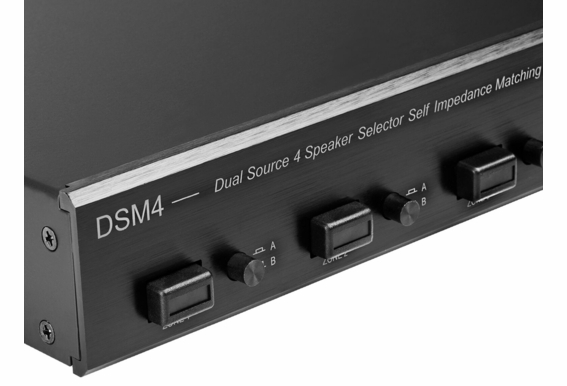 The DSM4 is a dual source speaker selector with an independent a/b switch per zone. With this unit, you can choose two music sources at each zone. Ugraded Model with Improved Input/Output Connectors! 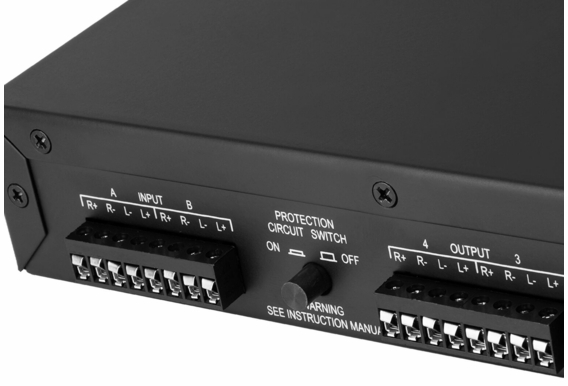 The upgraded, European-style removable input/output connectors give you better leverage when terminating cable and accept up to 14 gauge cable. 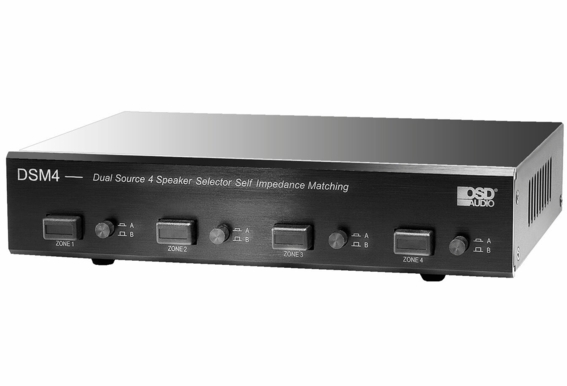 Dimensions; 6.5" x 4.4" x 1.93"
Dual source with independent a/b switch per zone - you can choose two music sources at each zone. I have a whole house speaker system controlled by a central amplifier and a selector switch. In my summer kitchen I have a pair of speakers that are by speaker wire run from the main house amp. I also have a TV in my summer kitchen and I would like to be able to have the sound from the tv come from the two existing outdoor speakers here. Would this allow me to select whether these speakers are fed from my house amplifier or from the outside source? If this is possible,I assume I need a separateoutside amp? Is there a simple inexpensive on you could recommend or is there a better solution? I have a home theater system that I also have a turntable hooked up to it. I want to get a old receiver for the turntable but don't want to use different speakers. Can I just hook up the main speakers to this and leave the surround sound, center channel, and sub hooked to the main receiver? I have 2 sets of speakers running on a Sony 7.1 receiver currently. One set is in my kitchen and one set is outside. I would like to install my surround sound system for my TV upstairs and have the ability to switch between the 4 speakers I currently have hooked up and the surround sound speakers in the TV room. Would this be a good fit for this product? I purchased the DSM4 and have a 7.1 Dual zone receiver. Which channels on the receiver do I hook up to the DSM4? Would I hook up the front & rear for Zone a on the receiver or hook up both fronts for zone A and Zone B? Hi, I am looking to do the following: - I have 2 zones; each zone with 7.1 speakers set (Front LCR, Mid LR, BLR and SW) - I have 2 receivers (Onkyo and Denon). They both share the BluRay and Multi CD Player (with a switch in between the players and receivers) - I like to be able to use either of the receivers to output to either of the zone speakers in 7.1 format. Can you please tell me what I should buy from your products and the wiring on this configuration? Can I input 2 different amplify into input A/B and output out to the same 1 set of speaker? Hello, I have Yamaha 577 5.1 AV receiver and 2 sets of LCR front speakers. I want to output LCR channels to speaker set 1 for movies and to speaker set 2 for regular TV. Projection screen and TV are located in different parts of the room so each set of speakers is located at its own place. What is best solution for me - should I: 1) utilize the Yamaha's built-in Zone 2 (which is stereo downmix, not 5.1), sacrifice the C channel of the set 2 (i.e. use only L and R channels) and escape all the headache OR 2) use DSM4 in the following manner: use only 1 zone of Yamaha; assign L and R outputs to DSM's input 1, and C output to input 2. Then, connect speaker set 1's L&R to DSM's output 1 and C to output 2; set 2's L&R to output 3 and C to 4, respectively. Is scenario 2) worth trying? Almost forgot: all my speakers are 6 Ohm Yamahas. Or, maybe you can suggest a single switch which instantly routes all 3 channels betweens different LCR sets? Thanks in advance! Would I be able to run this switch backwards? In other words I have 4 inputs ( + and -) and 2 pairs of speakers. I want to be able to switch the speakers across the 4 inputs. Thanks. Hi Kevyn, Unfortunately you would not be able to use it that way. You may want to look into our AB12 or SVC405. These items you could switch between 2 amps into 1 pair of speakers. 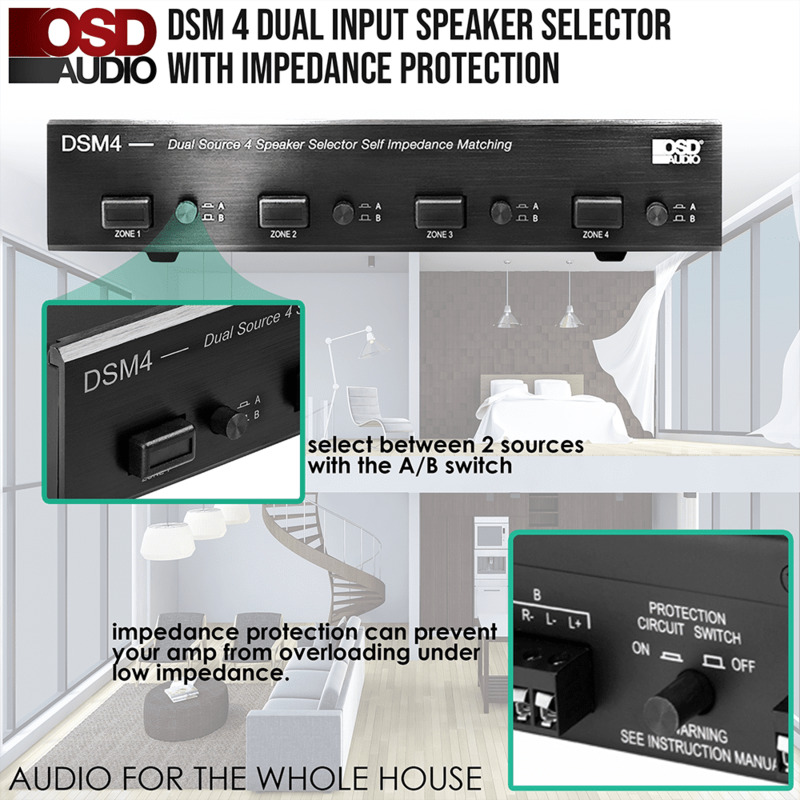 If my receiver only has outputs for 2 speakers I can't use the dsm4 to add more speakers to the system? Hi Piet, Technically you can, but it's not recommended as most receivers can only handle the load of 1 pair of speakers (8 ohm). 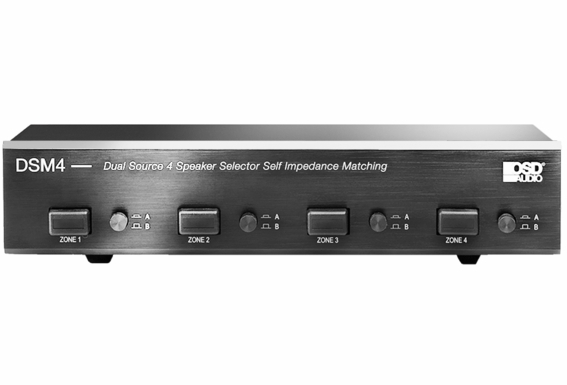 Running the speaker selector with multiple sets of speakers will increase the load on the receiver and could cause some issues. 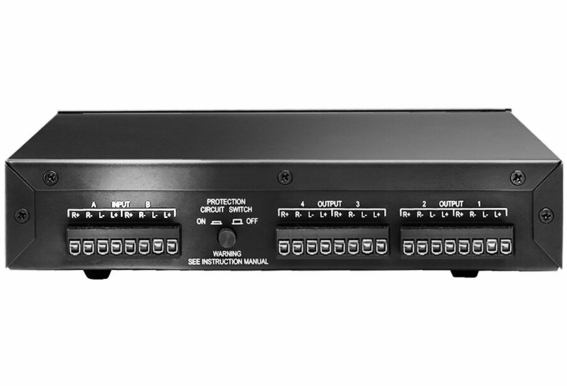 It would be best to check with the maker of your receiver to see if that's possible or you can run something like our AMP200, which will still allow you to run your receiver to the amp as a source. I have a sony receiver with the standard A-B A+B selections. Off of this I run 2 pairs of outdoor speakers, 1 set on deck, other by pool. I am doing a downstairs remodel and have wired for 3 speakers, 1 per room. 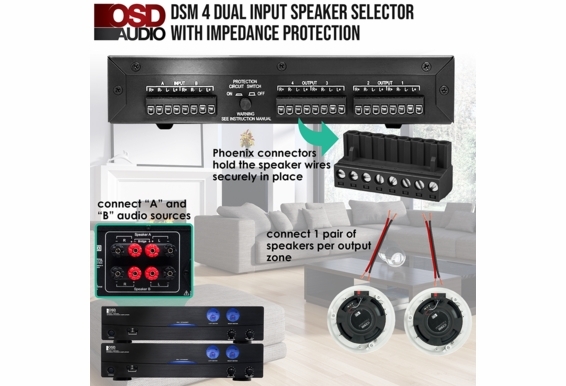 If I want to hook these indoor speakers up to this receiver and have the option to play any of the indoor speakers individually or all 3 at the same time, will this product allow me to? Hi Darren, This is the product to allow that, but you will need a more powerful amp. Receivers can only handle an 8ohm load typically which means they can run a single pair of speakers (2 speakers). 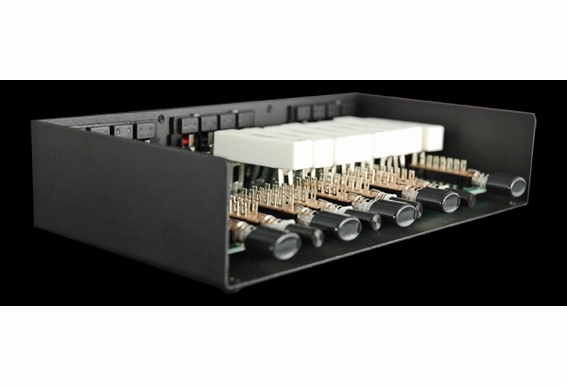 Usually our customers use at least the AMP200 for anything more than 2 pairs of speakers. I want to run one pair of speakers with two amplifiers (Pioneer Elite VSX84 for HT and Technics SU-V7X for Turntable/CD). Will this be the right product and does it protect the amps in case both are accidentally turned on. Also do you ship to Canada? Hello Preet, That should work fine but I would recommend contacting a licensed audio installer to be safe. I have a pioneer VSX-823 with 5 speakers and a sub woofer already connected to it. How can I add 2 more speakers on a different channel to this? For example the five speakers and reciever are in my garage. I would like to ad 2 outdoor speakers to this reciever. I want the 5 speakers in the garage to be off when listening to the 2 outdoor speakers. How can I do this? Hi Luke, You will most likely need an external amp to power that many speakers, which would also allow you to keep certain speakers on while others are off. I have two analog stereo receivers and two pair of speakers. 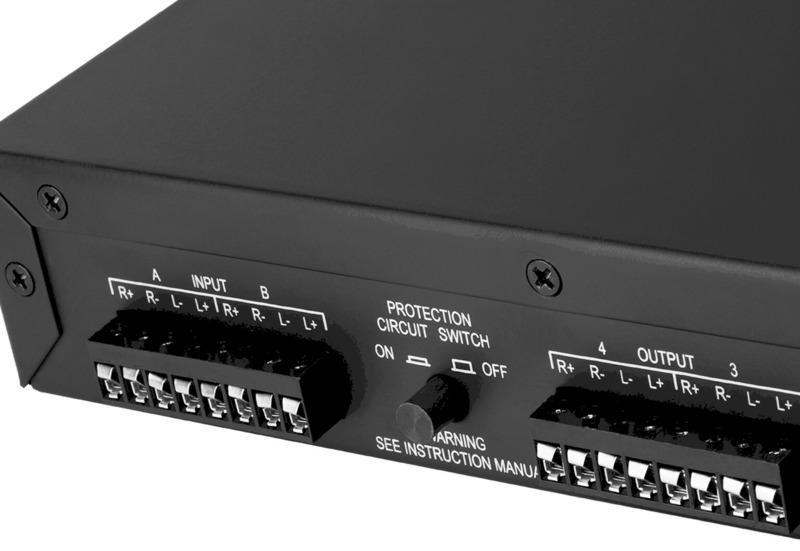 Will this let me switch back and fourth between receivers using the same pair of speakers? Are the inputs rca's? Hard to see and its not in the description. I had 4 pairs of RX640 rock speakers. 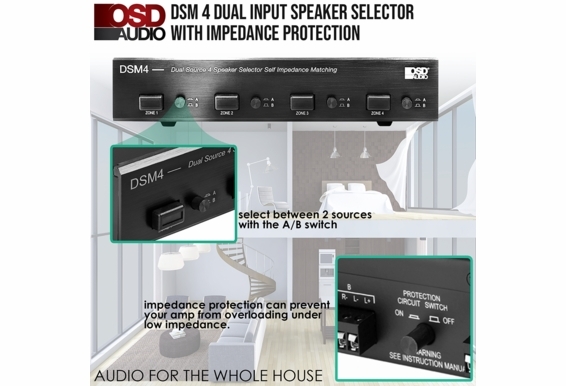 Can D SM4 speaker selector be used with RX-5502 stereo receiver to listen to only one pair of speakers (instead of 2 pairs) at a time? I have a new home with 4 rooms that are wired with in ceiling speakers . Four speakers in the first room and two in the other three rooms. I don't have an amp or receiver. 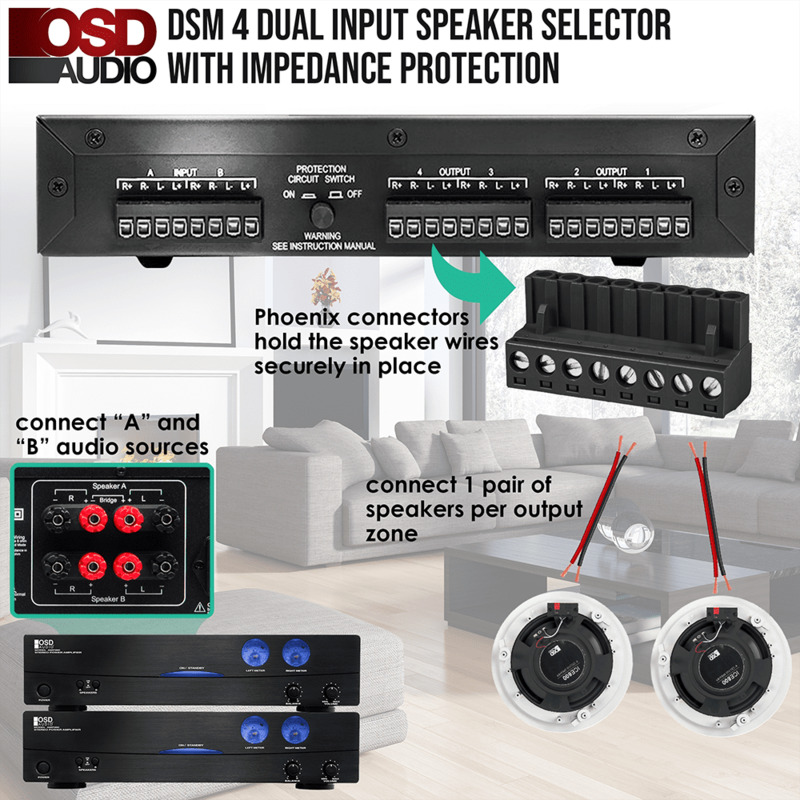 If I buy the, Home Audio Amplifier OSD-AMP200 High Current and the DSM4 Dual Source 4 Zone Speaker Selector with Amplifier Protection. Would these two items take care of my problem? I have a Pioneer VSX-1122-K 165watt receiver. I would like to know how I can add 4 sets of speakers onto the 2nd zone of my receiver. Will a speaker switch work or do I need an amp? I would like to be able to control the volume from the receive since it is connected to my network and I use my Ipad/Iphone as a remote. I don’t intend to have all 4 sets of speakers playing at the same time but as always more options are always better. I have a Yamaha HTR-5760 7-channel AV Receiver. The unit has an A & B speaker selector buttons. I will be running the Surround Sound off the A selector and 4 pair of ceiling speakers (in 4 other rooms) off the B Selector. Each of the 4 rooms has an individual volume control. Is the DSM4 the proper selector box for my intended use? I just built a deck with a roof over it. Its 14' by 35' the roof covers only 14' by 24'. I bought four in ceiling pyle weather proof pwrc81 and I have four pyle pdwr50w 6.5 speakers for the outside of the deck. 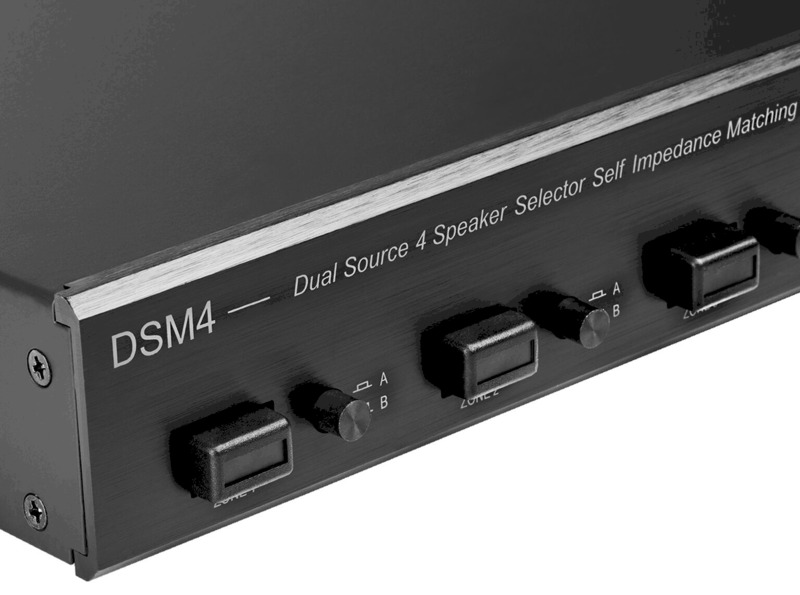 With the DSM4 can you turn on 2 speakers at a time or 4 at a time or all of them if you wiish.